This book has three different titles, printed separately in three languages - English ("The Forget-me-not Gardener"), French ("Le jardinier des myosotis") & German ("Der Vergissmeinnicht-Gärtner". Published by Éditions Gruériennes, Bulle, Switzerland. A selection of various images, not all included in the exhibition at Falmouth Gallery (August-October 2005). Text - just an introduction by Brian Stewart in English only. Price: £4.50. All had been sold, but this had to be re-done for the next similar show at "St. Barbe Museum" Lymington - 2006. Sixty-two transparent reproductions (ILFOCHROME CLASSIC TM) are on permanent display in the former Prison Tower of Gruyères Castle, Switzerland. Philippe Clément (Director of "Éditions Gruériennes") and Raoul Blanchard (Conservateur du Château de Gruyères) were both keen to produce this book in June 2002. In fact the products of this company need to be relevant to folks from the area "La Gruyère", so Patrick really felt pleased to "belong". His texts are printed side by side in English, French and German, comprehensible to practically every visitor. Georges Baechler (Now retired after being Marketing Director for ILFORD AG - Fribourg) dealt with scanning the imagery and sponsoring the project, a collaboration so relevant to the company's sub-title "Partners in Imaging". Ilford also gave a lot of help to Patrick's exhibition "Chemins de Traverse" 2002 - 2003. A children's story about a homeless little elephant. Published in both English and Welsh by D.Brown & Sons Ltd. in 1976. Also later in German by Sauerländer Verlag. Patrick is still extremely grateful for the collaboration by Peter Jones, who managed to get the book published in Welsh as an attempt to preserve a language at risk. This simple story is actually very significant regarding the career of Patrick's daughter Rosie, a zoologist concentrating on extinction and trying to find a solution for the difficult relationships between farmers and protected wild animals. Although the original price was only £1.95, signed copies have recently been sold for over £90. Hardback & softback:156pp:all in col:A4. A collection of Patrick's early imagery, mostly science-fiction and record-sleeves, with explanatory texts. Published in English, Dutch & German by Dragon's World Ltd. 1976. 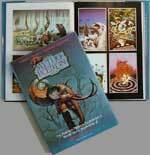 Roger Dean, a well-known artist with a fairly similar style, was collaborating at the time with Hubert Schaafsma, their first aim being to set themselves up as a publishing company and to produce Roger's first book "Visions". Roger telephoned Patrick shortly after that, suggesting the production of a similar book. The title attempts to join together the two words "mythopoeic" and "ikon". There was no agreement on the pronunciation, so you can say it however you like! A children's story about a duck with the strange talent of finding nourishment by removing holes with his beak, an ability that could even add extra weight to Swiss cheese! Patrick's two young kids, Danny and Rosie, illustrated the story - not bad at all! - before he did himself. Published in English, Dutch & German by Dragon's World Ltd. 1976. "THE PENTATEUCH OF THE COSMOGONY"
Possibly still available in CD format. The creation and destruction of our first home planet. A square book published by Dragon's World Ltd. and sold with two LP records in collaboration with EMI Records Ltd. in 1979, the music composed by Dave Greenslade. The story may sound rather sad, but in fact it is not. There is a happy ending. Texts in English only. 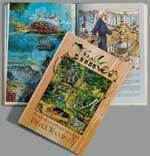 Hardback & softback:135pp:124 in col:266X288mm. 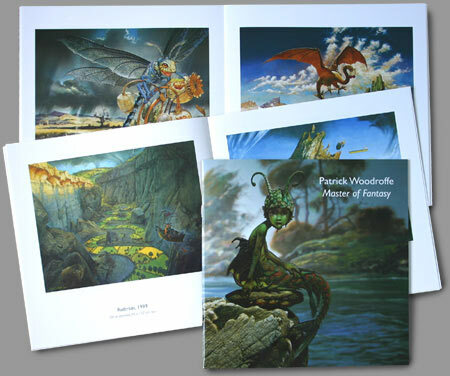 A book of Patrick's illustrated poetry intended to be put to music in collaboration once again with Dave Greenslade. But at that time the record industry was going through a very unstable phase, big projects such as this were simply too much of a risk. Published by Paper Tiger/Dragon's World Ltd. in 1984, the texts probably only feasible in English, although Patrick has already prepared an adaptation for the theatre in both English and French. So, if any potential producer, whether English or French, is interested in that, then please contact Patrick via his e-mail address. Hardback & softback:127pp:all in col:A4. An explanation of Patrick's traditional and invented art techniques - "tomography" for example. "Never think of this book as a how to do it," says Patrick. "I'd rather call it a how I did it." Published by Paper Tiger/Dragon's World Ltd. in 1986. Texts in English only. Hardback & softback:143pp:all in col:A4. An extended version of THE PENTATEUCH OF THE COSMOGONY but sadly without the music. Patrick still hopes to get this book published in German, especially as he realised with how much difficulty it would be interpreted by a translator, which motivated him to spend a lot of time doing what he would call his own translation/adaptation. Published by Paper Tiger/Dragon's World Ltd. in 1987. Texts in English and Japanese. Hardback & softback:79:70 in col:A4. A story for both children and adults about the conflicts and alliances between two radically different planets. Published by Paper Tiger/Dragon's World Ltd. in 1987. Texts in English only. In fact this story was received very enthusiastically when all the illustrations were on display for almost a year in Switzerland, the ideas somehow very appropriate to Swiss culture in comparison with others. Patrick came into contact straight away with the well-known Swiss animator Robi Engler, who expressed great enthusiasm for realising this as a film, digital animation from the original drawings. Patrick does actually appear in this story - as the "Dustpanjandrum", ruler of the planet "Regulo Five". Although you'd probably not recognize his appearance, you'd certainly agree with his character. See "IMAGE" page - D/78 Loose End, and D/81 Extra-Regular Influences. A retrospective of Patrick's best imagery. Published by Pomegranate Artbooks in 1993. Texts in English only, although French and German adaptations were prepared. The cover painting was originally done for a poster for Patrick's first exhibition in Gruyères Castle (1992), so the last few copies sold very well there until "La Tour du Prisonnier" became available. The printing for this book was of better quality than for any other. 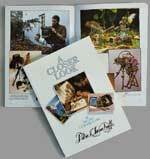 A catalogue for Patrick's show at "L'Hospice St-Charles" (Rosny-sur-Seine, France - 1997). Patrick's texts in French only. A little book including several images never reproduced up to that point.